It seemed that this was going to be just another mission trip to Moldova. Of course, as always with various problems to solve, things to sort out, times of joy and sadness; a unique trip as well, with its own story to tell, but was something really unusual going to happen on this trip? It all started several days before we set off ... through a lack of care, I hurt my spine and back muscles to such an extent that I couldn’t lift anything heavy. Even sitting behind the steering wheel was hard. I also badly cut my upper lip on Sunday evening, just before our planned departure on Monday morning. I thanked God with all my heart for Jacob who was by my side and who coped excellently throughout the trip. In such a situation all we could do was pray together and get down to work. We were focusing on two things. One was improving our mission base, Mission House ‘Metanoia’. 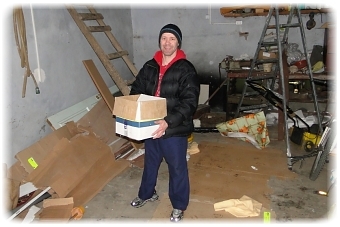 We wanted to tidy up and sort out around the outside of the property as well as fixing up the inside; and – what brought the most satisfaction – were the meetings with kids organised by our Board Games Club. There were also meetings of churches who we host under our mission roof. The other thing we were focusing on was, it could be said, work away from our base. So, meetings in Chisinau with Svetłana, the director of the ‘Liora’ Mission and with the house church leaders who meet in our Mission House ‘Metanoia’, Wową and Oksaną. In Peneszeszti we met with the director of a school Tatianą David. We presented her with a multi-media projector, an amazing gift from the parents and pupils of ‘Salomon’ Christian Primary School in Zielonej Góra. Tatiana is extremely grateful for this help! In Fagureni we met with pastor Petru, who is also carrying out work among the disabled, and we visited two families. Praise the Lord for them all! Praise the Lord for all the people in Poland, and indeed in other countries, thanks to whom our work can exist and develop! 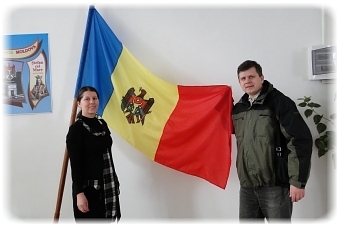 Together we make up the picture of the work in Moldova. It is my privilege to be part of the team and to be directly involved in this work! I encourage you to pray! Especially in the face of the recent events and changeable situation in the Ukraine. We always drive through this country on the way to Moldova. Due to the tense situation this time in the Ukraine, Jacob and I were forced to return home though Romania, Hungary and Slovakia. This is a much longer and harder journey. I still would like to travel on the transit route through the Ukraine, so a lot depends on what happens there. Our next trip will be in April! Thank you for all your help: prayer, financial, material support; for every encouraging word! We always need this! Not only in our work but also in our families and marriages. May the Lord lead us and guide us in all things, protect us, give us wisdom and courage to fulfil His will!